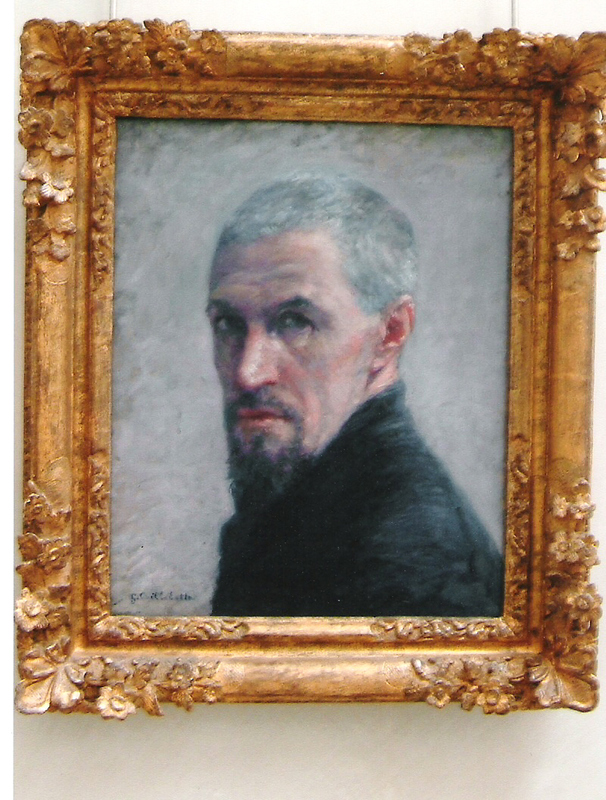 One of my favorite Impressionist Artist is Gustave Caillebotte( 1848-1894), one of the lesser known Impressionists. Caillebotte earned a law degree and license to practice, but after serving in the Franco-Prussian war he decided to follow his passion of painting instead. He became friends with several of the Impressionists including Monet, Renoir, Manet and Pisarro. Since Caillebotte came from a wealthy family, he did not have to rely on painting for his livelihood as his friends did. He purchased several of their paintings to help them out and even paid rent on occasion for their studios. My first introduction to his work was at the Art Institute of Chicago (Worcester Collection) with his Paris Street; Rainy Day (Rue de Paris; temps de pluie, also known as La Place de l’Europe, temps de pluie) (1877). This is perhaps his most famous work to date and represents the “modernization” of Paris which was created by the architect Baron Haussmann from 1853-1870 under the supervision of Napoleon III. In this painting you see flâneurs (men of leisure) out for a daily stroll. During this time period, Impressionists were moving towards “realism” or painting what they saw in every day life, or en plein air, rather than what was approved by the Salon. The first thing that struck me when I saw this large painting (83×108) was the light reflecting off of the cobblestone streets. While the parapluies give the impression that it is raining, you don’t actually see the drops except in the reflection. Notice, also, that the man and woman in the foreground are looking away from the gentleman who is approaching. It is common in le vie of the French not to make eye contact with strangers. The builidings at La Place de L’Europe, Caillebotte’s neighborhood, still look the same today. 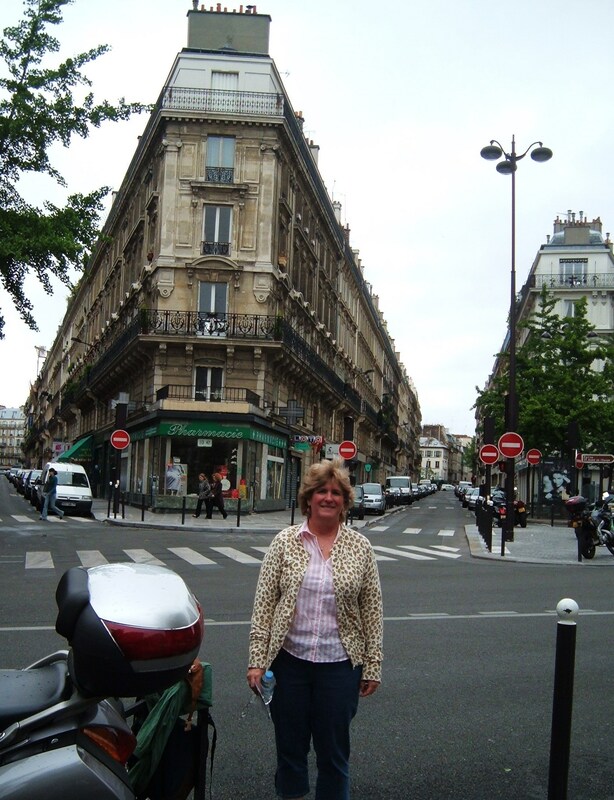 Gone are the cobblestone streets, but you can still frequent la pharmacie which you can see in the background. 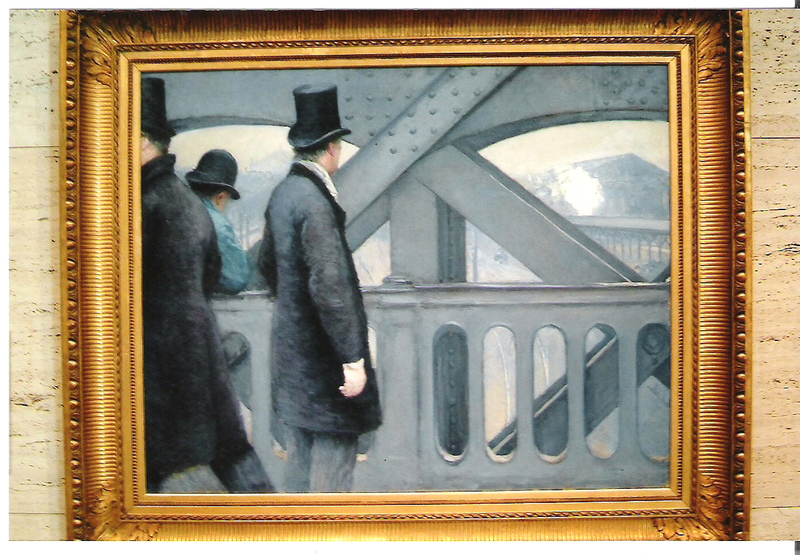 Another one of Caillebotte’s paintings that is well known is The Bridge ‘De l’Europe’ (Le pont de l’Europe) (1876) which is in the permanent collection at the Kimbell Museum of Art in Ft. Worth. Here, Caillebotte again depicts the modernity of Paris with the Gare St. Lazare in the background. The flatness and the photo realistic effect of this painting have been compared to the American realist Edward Hopper. Monet, Caillebotte, and Manet all used the Gare St. Lazare as themes in their paintings. The train station continues to be a hub of activity in Paris today as many tourists and commuters frequent these trains. 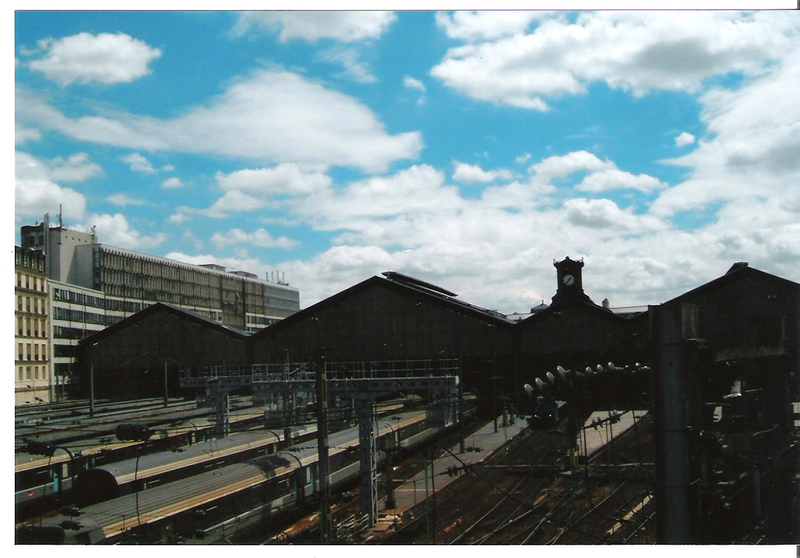 Below is a photo of the Gare taken from the same vantage point as Caillebottes. Caillebotte showed over sixty of his paintings in the Impressiont’s Exhibitions between 1876-1880. 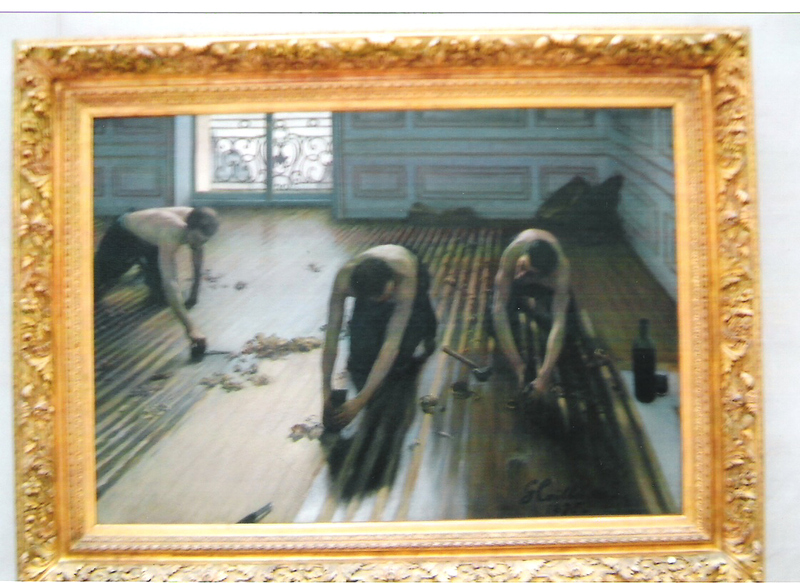 In the Second Exhibition in 1876 at 11 rue Le Peletier, Caillebotte exhibited Raboteurs de parquets (Floor Scrapers). This painting is in the permanent collection at the Musée D’Orsay. This painting was originally rejected by the Salon of 1875 for the showing working class. This was part of the Impressionist’s realism that caused them to decide to exhibit their work seperately from the establishment. Paris Street; Rainy Day as well as La Pont de l’Europe were both shown in the Third Exhibition one year later. 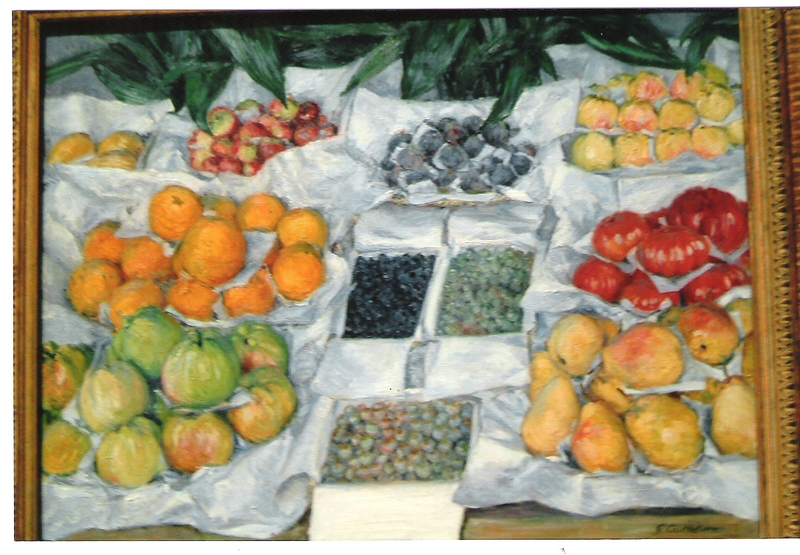 One of the last paintings that Caillebotte exhibited with the Impressionists was Fruits sur un étalage (1882) which is in the permanent collection at the MFA Boston. Caillebotte died much too young of a pulmonary embolism in 1894. In his will, he donated his large collection of paintings, including many of his Impressionist friend’s works, to the French government. The public is able to see and admire so many of these incredible works today because he stipulated in his will that they be shown and not kept in a private collection. Caillebotte is buried today in the Pere Père Lachaise Cemetery . **The Kimbell Museum is currently hosting “Gustave Caillebotte: The Painter’s Eye” in which the New York Times reviews as “Paris is REBORN”. Most of these paintings are in Private Collections across the world and are only available to the public in this exhibition. I too have enjoyed gazing at Caillebotte’s work. Clearly his artistic genius was combined with a generous heart when he donated his works not to the elite and powerful but rather to the people who too love the beauty of artistic expression. Many of the family are also buried in the same tomb: both parents, two step-mothers, two half-brothers and a half-sister, two full brothers, a niece, nephew and others. Read more about the family history and genealogy straight from the family’s own blog at http://www.MyFamilyJules.com, including how Caillebotte first met the Impressionists through Degas, how his family was linked to Napoleon Bonaparte, and which 1808 family painting is now on display at the Louvre.